With water and Gatorade bottles close by, students anxiously waited on the edge of their seats and the crowd enthusiastically cheered when their favorite team scored. The atmosphere of Clark Lounge in Campus Center resembled that of a professional football stadium this past Wednesday night, as it was the location of the Student Activity Board’s Madden tournament. 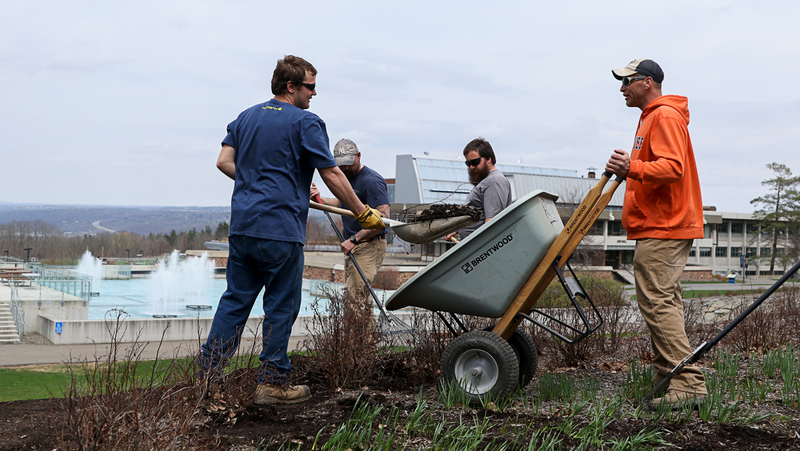 Each year, SAB sponsors several free events open to all students at Ithaca College. This was the first year SAB hosted a Madden Tournament, although similar events have been organized in the past. Executive director of SAB, senior Matthew Rakow said SAB has sponsored several video game events in past years. Junior Shanya Saunders, who coordinated the event, said the choice to have a Madden tournament was timely for students. SAB expected to have 24 people participate in the tournament, creating two separate brackets of 12 teams. The tournament was organized by single-elimination, meaning that as each team lost, they were removed from the tournament. The game eventually came down to the two winners from each bracket. SAB advertised the event in through word of mouth, Facebook, Intercom and posters displayed around the college. Junior Will Perez said the publicity for the event prompted him to participate. Saunders said the response to the news of the event happening — even before advertising — was positive. The 24 players, ranging from freshmen to seniors, eventually came down to the Pittsburgh Steelers and the San Diego Chargers, led by freshman Debanjan Bhaumik and senior Mike Valvano, respectively. With all the tension and excitement of a real football game, the tournament ended with a victory for Bhaumik and the Steelers. Bhaumik said he was happy with his triumph in the SAB tournament and his prize — a $25 GameStop gift card.